Intel was all about the ultrabooks at their CES press conference this morning, showing off a few of the 75 models company execs expect to see released by hardware partners before 2012 is done. While most of the ultra-portable laptops are expected to at least loosely follow the thin profile, wedge shape, and metal housing formula made famous by Apple's MacBook Air line, Intel also has at least a few wacky concepts up their sleeves, as evidenced by this morning's song and dance. Literally, there was dancing – in the form of a guy who ripped off his lab coat to reveal an Orange Crush t-shirt lurking underneath. Can't stop the dance, eh? The Nikishki concept was perhaps the most eye-catching, whether or not it would actually gain acceptance from the mass market. 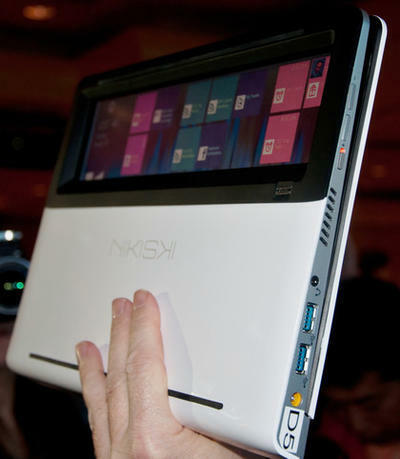 Nikishki looks like an ultra-portable laptop with an extra wide trackpad that spans nearly the entire width of the device. The trackpad is actually set in a transparent portion of the machine's housing, and is both visible and touchable/swipeable even when the ultrabook's lid is closed. Intel played up the possibilities of using such a device as a sort of cross between a laptop and smartphone/tablet, with keyboard-enhanced productivity and touch-powered convenience rolled into one unit. Given the emphasis on touch input expected from Windows 8 ater this year, that makes a ton of sense, even if the whole see-through trackpad screen thing might never make it to the mass market. Intel also announced a freshly minted deal with Nuance to bring their voice recognition tech to ultrabooks. And some ultrabooks will feature touchscreens. And others of the Ivy Bridge ilk will feature NFC capabilities. And others still, I'd guess, voice and touch and NFC all rolled into one. 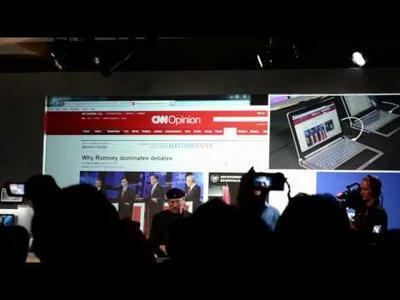 Intel also said that half or more of the ultrabooks expected this year will sport 14 or 15-inch displays. There was also talk about bringing models to market at prices well below the $999 mark – a potentially important move to combat Apple's MacBook Air line, which starts at $999. So what, exactly, makes an ultrabook an ultrabook? I think that answer will take a more solid form as these devices actually make it to market in the coming months. But from where I'm sitting, in the press room at the SuperBowl of Gadgets, the sky pretty much seems to be the limit when it comes to combining elements from netbooks, laptops, smartphones and tablets to make something Intel wants you to know as the ultrabook.